Winter is a whole different animal in Alaska. These facts about Valdez are proof. YES, THERE MAY BE fewer than 4,000 people living in this port city on Alaska’s south coast, but pretty much everything else about Valdez is monumental in scale — its coastal mountain topography, its access to adventure, and particularly its winters. Below is ample evidence that you simply don’t understand the full potential of the season if you haven’t experienced it in this corner of Alaska. 1. It’s the snowiest place in the United States. 2. Snowflakes are the size of apples. Three to four feet of snow can easily fall in Valdez overnight. Almost every year a few boats sink in the harbor due to the weight of the snowfall. And the team of drivers who continuously plow the only road in and out of town wear avalanche beacons so they can be located if their machines get buried. The snow makes for a winter paradise — but it’s not for the faint of heart. They’re just what they sound like, storage areas that exist solely so all the plowed snow has somewhere to go. And they hold so much snow that it doesn’t fully melt until midsummer. 4. Despite the heavy snowfall, Valdez schools have only had one snow day in recent memory. The winter of 2011-2012 brought an unusually heavy snowfall in town. By January 24 of 2012, 327 inches had fallen in Valdez — already well over the yearly average of 300. December alone saw 152 inches, with another 103 falling in January. City-owned buildings, including schools, reported snow loads that exceeded their design capacity. For the first time in decades, Valdez kids got a snow day. 5. If you ski here, you don’t take a lift to the top. You take a helicopter. 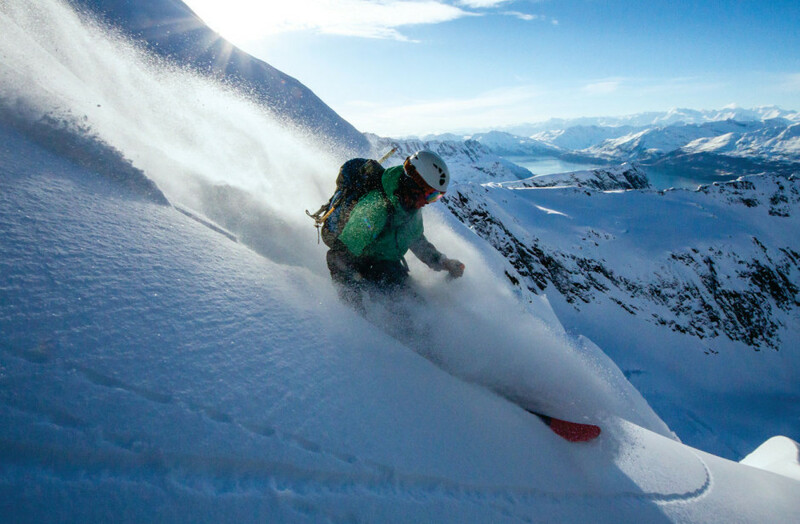 There are four heli-ski outfitters based in the greater Valdez area, and zero ski resorts. That’s right — no lines to the top here. 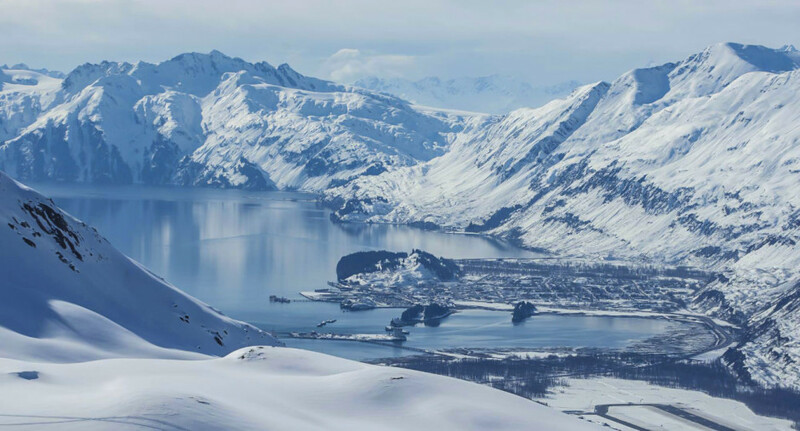 With its rugged, undeveloped mountains, Valdez was one of the first places heli-ski operators set up shop in the US. It’s considered the birthplace of big mountain skiing in Alaska, and it remains one of the world’s top skiing destinations today. 6. It hosted the World Extreme Skiing Championship for its entire 10-year run. 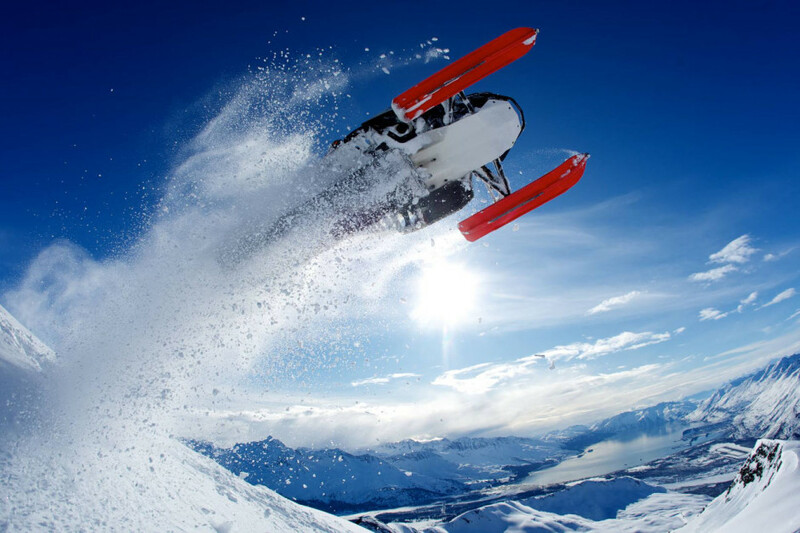 The competition took place in Valdez from 1991-2000, and much of the fame the city has received for being a prime winter destination is thanks to the publicity generated by this event. When you’re in town today, you can check out a collection of memorabilia from the championships at the Valdez Museum & Historical Archive. These are some of the tallest coastal mountains in the world, rising like tidal waves straight out of the sea. Though their average elevation is only 4,000 feet, the proximity to the waters of Prince William Sound gives them a prominence that makes them feel much higher (and they actually do get much higher: The tallest point in the range is Mount Marcus Baker at 12,884 feet.) It’s also that proximity to the sea that makes the Chugach Range one of the snowiest places in the world. 8. …as well as the dramatic Prince William Sound. Dotted with small, rocky islands and ringed by mountainous fingers of land that reach right into the water, Prince William Sound is one scenic place. Its two million acres comprise the centerpiece of the 5.3-million-acre Chugach National Forest and contain more tidewater glaciers (glaciers that terminate in the ocean) than anywhere in North America. A landscape of ice, waterfalls, and lofty peaks on the horizon, populated by some of the state’s most iconic wildlife — this is Alaska at its wildest. 9. 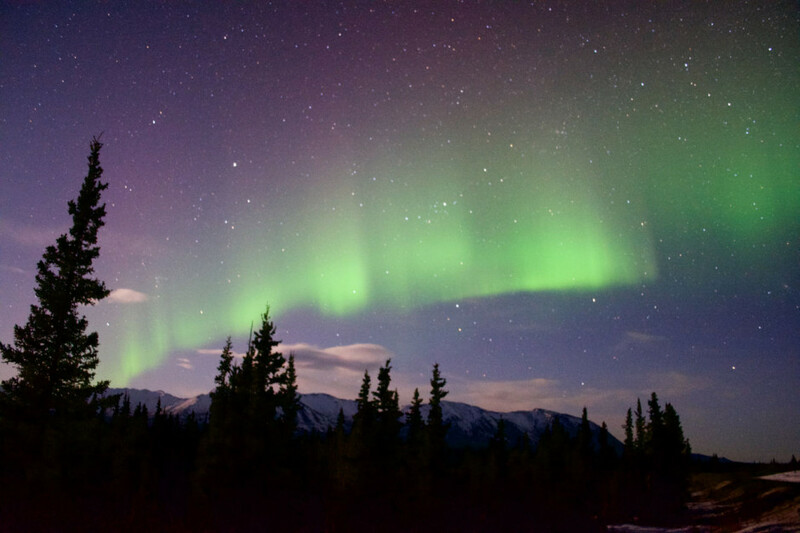 It’s one of the most spectacular places to watch the Northern Lights. It’s hard to beat that backdrop for seeing the dancing lights of the aurora borealis. 10. Glaciers are as common (if not more so) as street signs. The 32-mile-long Columbia Glacier is one of the fastest moving in the world; 13 million tons of ice often break off its face in less than 24 hours. Worthington Glacier gets fed by the snows of the Chugach Mountains around Thompson Pass, and it’s one of the only glaciers in the country that can be accessed by paved highway. Then there’s Valdez Glacier, Meares Glacier…we could go on, but you probably get the picture. For an unforgettable look at these ancient rivers of ice, head out on a flightseeing tour with VS Helicopters. 11. World-class ice climbing is 13 miles out of town. Just outside of Valdez lies Keystone Canyon, where a 10-minute hike will put you at the base of legit multi-pitch ice. Sign up for the annual Valdez Ice Climbing Festival to climb Keystone classics, take part in speed climbing comps, and connect, feast, and party with like-minded souls over three days. 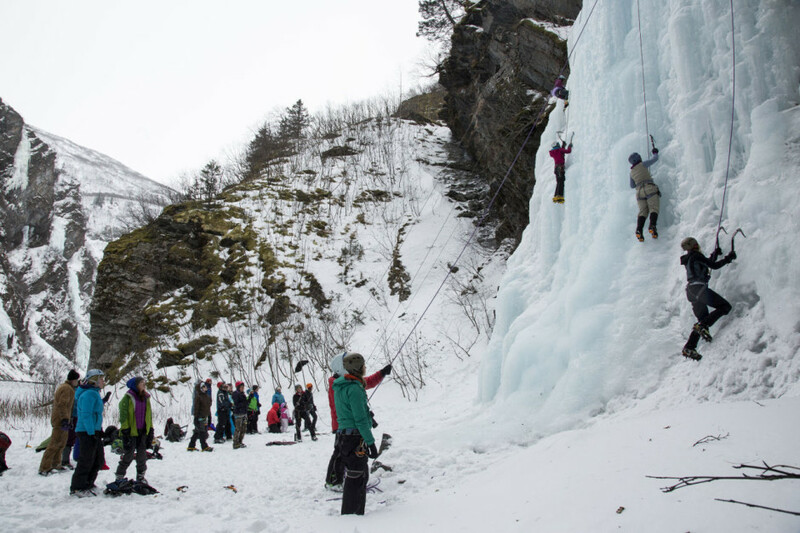 This year’s event saw over 300 climbers take on the 600-foot frozen falls. Newbies needn’t feel left out, as clinics are offered for the less experienced. 12. And dozens of other festivals and tournaments take place here every winter. Like the Valdez Qaniq Challenge — a two-day cross-country ski race combining both classic and freestyle skiing with prizes totaling $10,000. There’s also a Wounded Warrior Poker Run, a 13-mile snowmachine race, the Chugach Fat Bike Bash, the Frosty Fever Winter Carnival — which equals a week of survival suit races, polar bear plunges, snowshoe softball games, and other epic events you never realized needed to be invented. And then there’s Tailgate Alaska, a ten-day festival in the Chugach Mountains. 13. Seafood from Prince William Sound is a given, even in winter. This post is proudly produced in partnership with ValdezAlaska.org.